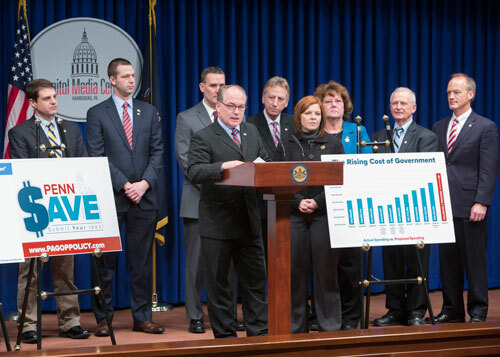 Rep. Donna Oberlander joined a number of her colleagues on Monday to announce PennSAVE, a Republican-led initiative to find ways to save taxpayer dollars by cutting government waste and inefficiencies. Oberlander has been appointed to serve on PennSAVE and is actively soliciting cost-saving ideas from the public. Residents can submit their ideas at RepOberlander.com. HARRISBURG – In looking for cost-savings and efficiencies in state government, Rep. Donna Oberlander (R-Clarion/Armstrong/Forest) has been appointed to the House Majority Policy Committee’s PennSAVE task force and is asking residents of the 63rd District for ways in which the Commonwealth can save money. PennSAVE is a Republican-led initiative to find ways to save taxpayer dollars by cutting government waste and inefficiencies. The group will be researching several potential cost-saving measures across state government including possible state agency and program consolidation, unaddressed audit findings government procurement policies along with overall waste, fraud and system abuse. Oberlander also encourages local residents to participate in the initiative by submitting ideas and strategies for how to make government more efficient. They can do so by visiting RepOberlander.com and selecting the “PennSAVE” banner. The initiative will also include coordination with other state House and Senate committees, as well as the governor’s office and its executive agencies, in order to solicit suggestions.